Let’s be frank: Energy usage doesn’t usually feel like the best conversation starter — let alone icebreaker. Yet, we all experience our energy usage every day in unique ways, and the more conscious we can be about these experiences, the more likely we will start taking action to make wise choices about the energy we use. One of the ways that our partners have facilitated this kind of awareness among communities in Chicago has been through events that bring people from diverse backgrounds together to talk energy. 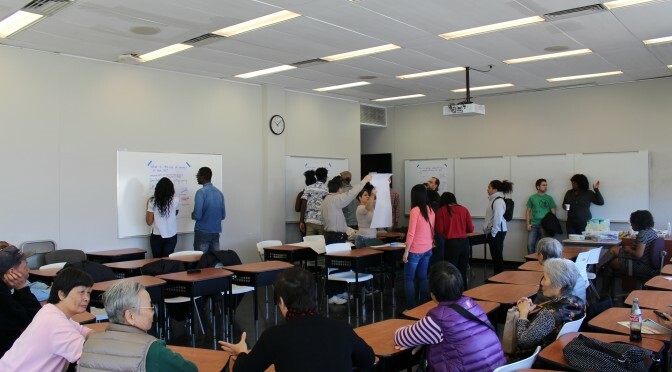 This past November, Sacred Keepers Sustainability Lab worked with the Illinois Institute of Technology’s (IIT) Office of Campus Energy and Sustainability and Office of Campus Life and our partner the Institute for Cultural Affairs (ICA) to host an intergenerational event that brought youth and elders from Chicago together to explore their values around energy usage. Members of the Chinese American Service League and IIT’s Black Student Union also attended. Given how much our power grid and technology has evolved over the last century, an intergenerational conversation was a particularly fruitful way to think about how we use energy and how we want to change these habits. The elders and youth in attendance participated in an activity to explore the senses they associated with energy. How do you feel something that seems so abstract? Some of the different discussions that emerged centered around the way household chores like cooking and washing clothes have changed. Elders talked about their recollections of clothing being washed on a washboard — a sound that has now been replaced in most households with the tumult of a washing machine. After the workshop, all of the participants went for a sustainability tour of IIT’s campus, learning about the innovative technologies and techniques the university is using to save energy and money, including a campus garden, a solar powered car share station, and a wind turbine for research. The event also helped people learn about steps they could take to make their households more energy efficient, and save money. “People were excited to learn about the technology, and that there are opportunities to save money and energy that are actually manageable and actionable,” Samantha Sainsbury from ICA told me during a conversation about the event. We love how creative this group was in thinking about energy. If you’d like to learn more about the organizations involved, please visit the websites of the Institute of Cultural Affairs, Sacred Keepers, Chinese American Service League, and IIT’s Office of Campus Energy and Sustainability, Office of Student Life, and Black Student Union.